There are so many benefits to a Crane Cool-Mist Humidifier that everyone should have one in their home. It can increase air moisture for easier breathing, relieves cough, cold and flu symptoms including nasal congestion. There are so many benefits you might be surprised at how many! Better yet for all the health benefits there are the Crane Humidifier is extremely well priced! 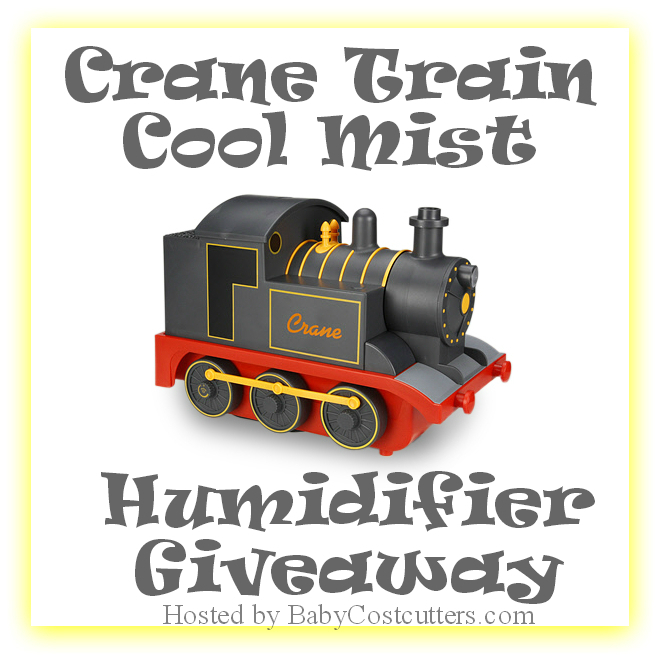 One lucky winner will win this awesome Crane Train Ultrasonic Cool Mist Humidifier rv$59.99! To learn all about this Crane Train Ultrasonic Cool Mist Humidifier read BabyCostcutters’ full review HERE. I like the Drop Shape Humidifier (Green. The train or the elephant. I think the train is my favorite but a close second would be the doggys! I love them all! We had the frog for a long time and loved it. Thw train is awesome and the duck is adorable! Hehehehe, I love the Hello Kitty one….toooooo cute! I like the Dragon -very cute! I really love the duck humidifier. I like the train for my grandsons room, it would be awesome! I love this train one the best. The frog one is cute too but I really love the train. I like the train, and the green teardrop shaped one. I LOVE the train humidifier. My youngest is in love with trains. For me, I love the green drop. I like the train the best. I like the Hippo Humidifier. I also like the Monkey and the Dragon! I think the pig, tiger, and train humidifiers are adorable! I also love the bold colors of the vaporizers! I particularly like the Drop Shape Humidifiers, and my favorites are the White or Blue ones. I like the drop shaped one in pink. I would love to win one of the animal ones for my daughter’s room. I’d probably choose the owl or monkey! The Digital Germ Defense Humidifier looks like the way to go!! I like the plain cool mist humidifier. #EE-5949. If I could only choose one for my favorite, it would probably be the frog humidifier. They’re all adorable, though. I like the Monkey cool mist one and the train I really like too. I like the HIPPO Cool Mist Humidifier! Thanks for the giveaway! I love the OWL Cool Mist Humidifier. I like the drop shape humidifier in orange. I like the germ defense humidifier, and the hippo. my favorite is the cow I have cow print all over my house. I love the all white drop humidifier! I like the drop shape humidifier but honestly I think the train is my favorite. It would be for my grandsons room and he loves trains! A Hippo?! I don’t have the hippo one yet! We have the frog, the penguin, a pink bear, the red dragon, the elephant, and the puppy. Every room gets a humidifier when the weather drys out. Helps prevent the bloody noses the my kids and I are prone to getting. I love the ELEPHANT Cool Mist Humidifier….I love elephants! This train one is my favorite! Besides the train 🙂 I also love the OWL Cool Mist Humidifier. I really like the duck humidifier. The germ defense humidifier. My son would love the train though! I love the Drop Shape Humidifier in Green. …THIS ONE! Ya see… Dad was VERY ‘into’ trains… & All Aboard just seems too perfect! They are so cool looking,would love to own any of them,thanks for the chance. I love the Hello Kitty Humidifier. I can’t choose between the monkey, dog, and the red dragon. they are all adorable. but…..since I have to choose just one, it would be the dog. LOVE LOVE LOVE the train!!! WE’re redoing my toddlers room in trains so this would look AWESOME!! !